Providing the best possible patient experience is a goal that Zippy strive to achieve in collaboration with our clients. We understand that clinical environments such as hospitals, medical centres, specialist groups and aged care facilities have very specific requirements when it comes to the services provided and the procedures that must be adhered to. Zippy consistently delivers to these requirements through quality controlled processes, procedures and attention to detail to ensure that the highest standards in hygiene and contamination control are met in accordance with the Department for Health and Ageing Cleaning Standards for Healthcare Facilities. 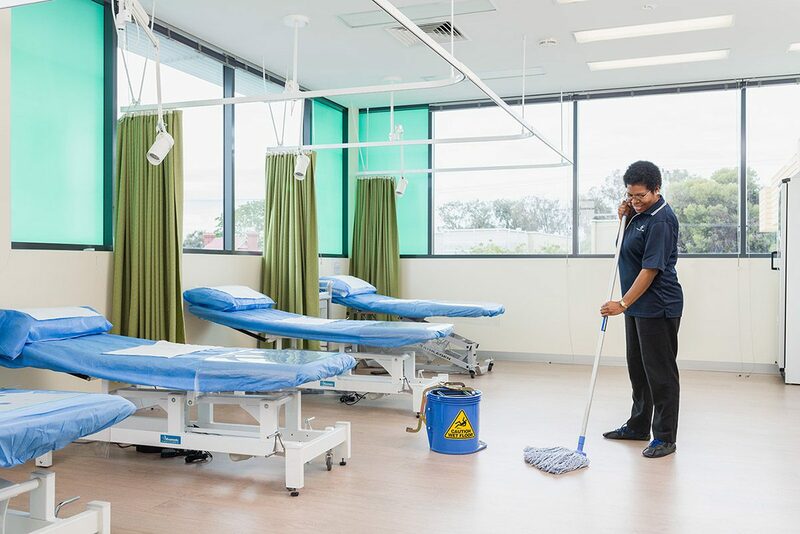 As the first South Australian cleaning company to achieve GECA Accreditation*, Zippy are proud to be able to offer clinical and medical facilities the opportunity to improve the health of patients and staff through our innovative chemical free cleaning options. This impressive system is able to assist in improving air quality readings for particulates, mould and bacteria as well as reduce water consumption and adhere to responsible waste management practices. Together, we can create a safe and healthy environment for all individuals who visit the facilities. Security is paramount when providing cleaning services to any facility that stores highly confidential information and it is important to Zippy that our clients feel safe and that all sensitive information remains secure. It is a standard requirement of all Zippy staff that they hold a National Police Clearance prior to commencing work on any of our sites. Furthermore, we are able to ensure that our staff hold or obtain any additional clearances that our clients require, Working With Children for example. Our Client Services Managers will also ensure that any specific site inductions are completed by all staff prior to commencing work on site so that all staff are aware of the individual facilities security and emergency procedures. Zippy are able to provide standard daily clinical cleaning services to your facility or we can tailor our specifications to your facility’s particular requirements.